You guys. It is very rare that I will knit the exact same thing twice for myself. There are so many awesome knitting patterns out there, I just want to try them all! But, it’s happened. 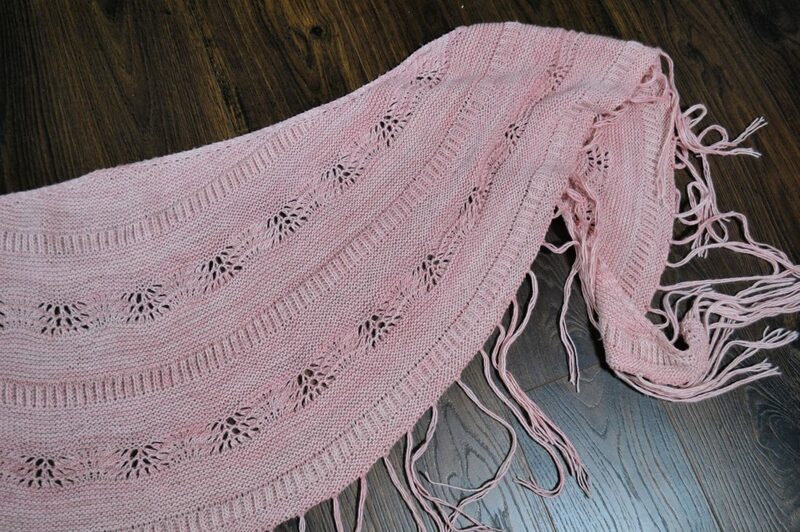 I’ve now made two Boho Blush shawls. My first was finished almost two years ago, out of a really pretty berry red Madeline Tosh Twist Light yarn in the colorway Tart. It has seen so much love since then, but it’s not exactly the kind of shade I want to be wearing this Spring. So, while I still anticipate wearing the first a ton in the fall and winter months, I did also want something in a more suitable color to wear now. Enter Madeline Tosh Merino Light in the colorway Scout. This is such a pretty, muted pink, and I’ve been incorporating more and more of this color into my current wardrobe. The yarn itself has a really cool texture. It’s a single ply yarn, which I don’t see out in the wild too often, but I always love working with it. It’s got a unique, almost handspun look to it, and each stitch really pops because it doesn’t have to compete with any other textures. Fringe made with this yarn is also really pretty, and would give any project that easy, breezy Boho look, even if the pattern wasn’t trying to do that. The pattern itself is very easy to follow, as all of Andrea Mowry’s patterns are, and incorporates a few different techniques, working together to create an effortless, beautiful, crescent shaped shawl. The cool thing about this shawl is that if you look at it objectively, the majority of it is garter stitch, which is one of the first textures you learn when you start knitting. But, then it’s broken up into some lace segments and brioche that make it a little more complex – it’s a fast knit that looks like it would be much more difficult! Now, that’s not to say that this is a beginner’s project. In fact, I would recommend this more for an intermediate/advanced knitter, simply because lace can get a little confusing if you don’t know how to read your work, and while brioche looks like it would be really easy, personally, I haven’t found that to be the case. The brioche used in this project is fairly straightforward, but it is still a bit of a learning curve. If you haven’t done it before, and are interested in trying brioche, though, this would be a good experimental project! The whole thing is topped off with a fringed edge, and I’m going to admit that both times I’ve done this shawl I’ve debated putting the fringe on – it takes so long to do, and is so boring to me – but it’s been worth it both times. 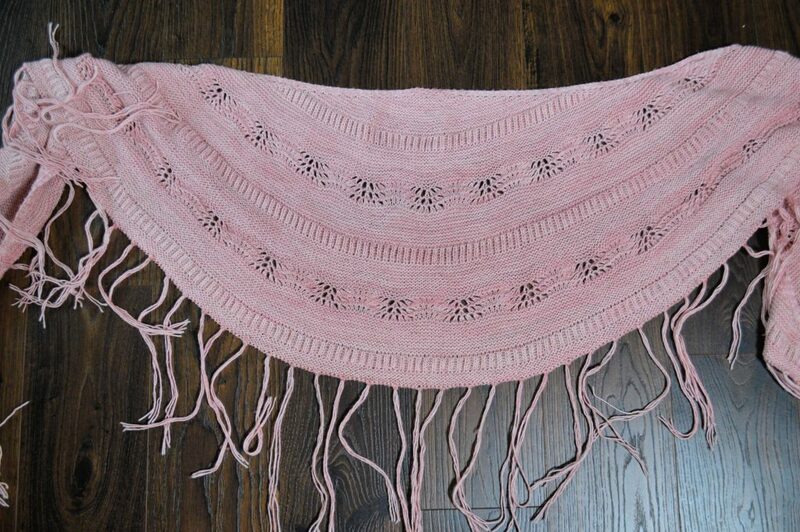 Fringe just adds a really cool, casual element to it, and really allows you to throw this shawl on over anything. I have found that the easiest way to cut fringe is to measure out the length you want to use on a table, and mark it with some masking tape. Then, rather than measuring every single time, you just lay the yarn out and cut. It makes the process much faster. Now, I know a lot of knitters will tell you this, but I can’t reiterate it enough: BLOCK YOUR PROJECTS! Until a few years ago, the only time I would block my work was if I needed to do some sizing adjustments post-knitting, but it makes such a difference. Even if you’re pretty good at keeping your stitches nice and even at the same tension, blocking makes them look just about perfect. It is very rare that I don’t block my work, now. I love how this shawl turned out, and I think it will be the perfect addition to my wardrobe. Even though it’s a handmade item with a Boho style, it still has a polished look to it, which is what I’ve been trying to channel lately!